The Ultimate Collector Series TIE Fighter is £30 off at the moment from Toysrus and its the cheapest i've seen. You also get a £20 Lego gift card to spend on Lego. It'll be cheaper on eBay once people realise that it's a VERY poor investment. I think this will be below £100 soon as it's a dreadful seller. It'll be cheaper on eBay once people realise that it's a VERY poor …It'll be cheaper on eBay once people realise that it's a VERY poor investment. I think this will be below £100 soon as it's a dreadful seller. As reason why? It’s looks like a pretty good set. He's a troll. Just ignore him. Spends his whole time on here rubbishing other people's Lego deals. Turns up on every deal with some banal remark as if he is some great Lego guru. Lego is for playing with, not investing anyway. Those days have pretty much long gone. Actually the reviews ARE pretty poor, it's all down to the fact that the sides are mirror images so the technical complexity of the bulid is not that high, and gets quite boring. Once its assembled it looks good. A typical comment below. 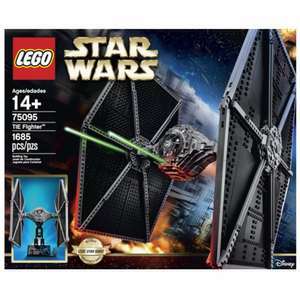 Of course, as it is a LEGO Star Wars set, its piece/price ratio is poor and the build is quite repetitive as you just have to build every part twice. Kicked across the floor by lazy TRU staff, thrown into a bin-liner, thrown into a UPS van and then thrown onto your doorstep and left in full view of everybody and the elements - NO THANK YOU !!! Even if you collect, expect a tatty box with teeth marks and remains of chewed sweets, not to mention the dreadful racket of unruly kids and their obese, uncaring mothers blocking the aisles with their muffin-tops and triple-buggies! A very unpleasant shop that deserves to go down the pan, which it is! Kicked across the floor by lazy TRU staff, thrown into a bin-liner, thrown …Kicked across the floor by lazy TRU staff, thrown into a bin-liner, thrown into a UPS van and then thrown onto your doorstep and left in full view of everybody and the elements - NO THANK YOU !! !Even if you collect, expect a tatty box with teeth marks and remains of chewed sweets, not to mention the dreadful racket of unruly kids and their obese, uncaring mothers blocking the aisles with their muffin-tops and triple-buggies! A very unpleasant shop that deserves to go down the pan, which it is!Cooling added again!